Delay-tolerant network (DTN) allows nodes to follow, store, and forward packets through different delivery mechanisms. These data bundles are created by sender to send data to multiple destinations. DTN supports multicast approach for communication. DTN enables the capability of transmission that involves long interruption, wait, and interoperable communications among these networks. Congestion in wireless network remains a challenging issue as enhancing the available bandwidth of network is not possible. Multicast communication in DTN network might be an intricate subject because nodes generously move within the surroundings that often become insecure due to the absence of centralized architecture. 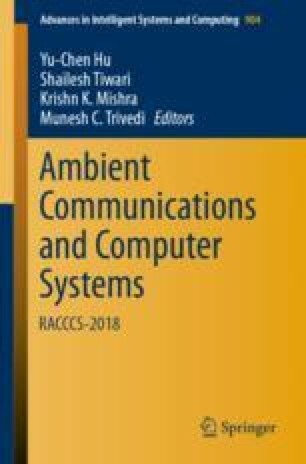 This paper proposes a network-coding-based congestion control scheme for delay-tolerant network communication (NCCCS-DTN). NCCCS-DTN using network coding functions is better than its state of the art (CASPaR). The proposed NCCCS-DTN reduces the bandwidth consumption and also lowers load on the link. NCCCS-DTN approach provides best route and also utilizes bandwidth and offers efficient congestion-free communication.